New York — President Uhuru Kenyatta has called for urgent reforms at the United Nations to ensure Africa is allocated two permanent seats at the Security Council complete with all attendant rights and prerogatives. Speaking when he delivered Kenya's country statement at the UN General Assembly on Wednesday afternoon, the Head of State said, besides the two permanent seats being demanded by the continent, Africa deserves more non-permanent seats. Currently, Africa has three non-permanent seats at the UN Security Council. "Kenya joins in the demand for two permanent seats for Africa, with all the rights and prerogatives of current members, including the right of veto, and additional non permanent seats," said President Kenyatta. The additional seats, said President Kenyatta, would correct the historical injustices that Africa has suffered at the global body over the years. 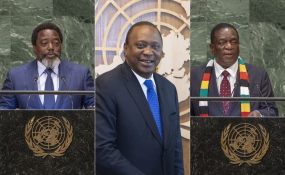 "As we all know, Africa is under represented in the non permanent category of the Security Council and not represented at all in the permanent category," President Kenyatta observed. "This historical injustice is a clear indication of the skewed system that has perpetuated an exclusive model of governance that fuels the trust gap between nations, " the President added. In the speech that lasted slightly under 20 minutes, President Kenyatta pointed out that real change at the global body cannot be realized without reforms to the membership of the UN Security Council. He said the global governance system needs to reform for it to be relevant and effective in addressing current and emerging global challenges. He pointed out that multilateralism has come under severe strain due to mistrust among global leaders and can only be addressed through genuine reforms. "Rarely has the system of trade and security that was established following the Second World War, under the aegis of the United Nations, been under greater strain," said President Kenyatta. The Head of State pointed out that populism and extremism unleashed at the national level has brought forward powerful constituencies that want a dismantling of the global order. For this to change, said President Kenyatta, there is an urgent political need for the world to close the trust gap between people and governing institutions. "Governments are not owed trust by citizens; that trust must be won and protected. It is not an exaggeration to say that on this issue, revolves the future of global stability and the continuity of many states," the Head of State observed. He noted that mistrust among the global community can only be addressed if the leadership and processes of the multilateral system are inclusive of all stakeholders. "The gap in trust at the global level is aimed squarely at the leadership and processes of the multilateral system - as reflected in the UN Security Council, the Bretton Woods institutions and other parts of the system," President Kenyatta noted. The President said lack of proper inclusive leadership at the global institutions has greatly contributed to corruption and impunity not only in national governments but also globally. "Without governments and the international system addressing the broadening deficits in fairness, inclusivity, and anti-corruption, populism, radicalisation, civil strife and political instability will continue to destabilise and destroy" said President Kenyatta. President Kenyatta further observed that for national governments to succeed in combating corruption, there is need for the international organizations, which continue to demand good governance and accountability to show by example, by taking necessary measures to combat the unnecessary evil. "The single overarching aim must be to make it exceedingly difficult to transfer and launder illegally acquired wealth in any part of the world," the Head of State said. "All UN bodies should be tasked with detecting corruption in their different focus areas and promoting the skills and systems to combat it. In the understanding that honest, transparent and responsive government is fundamental to the achievement of their aims," he continued. President Kenyatta said time has come for the global community to embrace bold solutions for it to succeed. While citing the Kenyan situation in which an aggressive campaign is underway against fraud and abuse of public office in order to restore confidence in governance, the President said: "We have to fight impunity and corruption. Seriously and without fear or favor." The President said that in its efforts to bring about good governance, Kenya has reached out to partners such as Switzerland and the United Kingdom in order to return illegal proceeds of corruption which have been stashed in their banking and financial systems. The President noted that current challenges bedevilling the world require greater cooperation and partnerships so as to achieve better solutions for all. President Kenyatta said the world stands in a decisive moment, and pledged Kenya's willingness to play its part by championing for change for the benefit of all. "Today's problems, risks and threats are complex and call for more not less cooperation, more not less observance of the rule of law, more not less negotiations; we need a rule based multilateral system," said the Head of State. Earlier in the day, President Kenyatta attended and addressed two side meetings on Tuberculosis and Climate change.